Have you ever been on a hike in the woods and hear a bunch of blue jays, chickadees, titmice, or blackbirds carrying on as if they are angry about something? Whenever my husband and I do we try to locate where the birds are because there is a good possibility that there is an owl causing the problem. It is perched in a tree where it roosts during the day. The birds do not want the owl there because it is a predator so they are mobbing it to get it to move. This is one of a few ways that you can find owls. 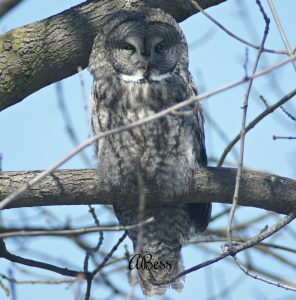 Read on for other ways…..
Great Grey Owl seen at dawn in Minnesota 2018. It is not a guarantee that every time you hear this mobbing noise that you will find an owl. These birds may be mobbing a hawk, a crow, or heron, or any other predator of theirs that is in their territory. Other telltale signs are whitewash (owl poop) streaked down the trunk of a tree or at the base of tree (especially evergreen trees). This is a sign that an owl has been roosting there and may be a favorite spot for it. Another sign is owl pellets. 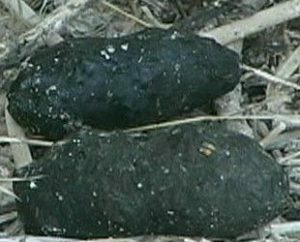 Owl pellets are oblong shaped balls of fur, feathers, bones, and beaks that an owl cannot digest so it regurgitates it where it lands at the base of a tree or post. It takes about six hours or more after feeding for an owl to make a pellet and it may make one or two a day. If you find more than this at the base of a tree or pole, it is a definite sign that the owl frequents this spot. Newer pellets are more of a shiny black while older ones are more gray. Added Note: If you ever find an owl pellet it is kind of cool to dissect it to see what animal the owl has eaten. When I was an elementary school teacher I would collect them for science class and let the kids dissect them. They just love it! 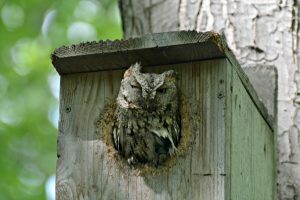 If you ever come across an owl nesting box while on a hike, check the hole as Screech Owls especially like to rest at the entrance to them. Cavities in trees are another spot to find these owls at the entrance. Having binoculars with you is an added plus so you can get a better look. Eastern Screech Owl that my husband found while on a hike. Additional Note: If you do see something sticking out of a hole to a nesting box or tree cavity it may also be a squirrel, a raccoon, or a snake too. You just never know. Looking for owls at dawn or dusk is probably the best way to find an owl. This is when owls are out hunting for food. You may see them on a limb usually near the trunk of a tree or on top of a pole or building near an open field or in a park as they search for their dinner. If you have a wooded backyard you probably have heard owls calling or have seen them flying through. There are 19 owl species found in North America. 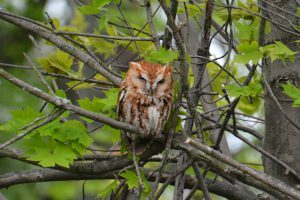 Where I live in Kentucky the most common owls you can find are the Great Horned Owl, Barred Owl, and the Eastern Screech Owl (other less common are the Barn Owl, Short-eared, Long-eared, Northern Saw-Whet, and Snowy Owls that are seen here during different times of the year). By knowing what owls are in your area you can learn their individual calls to be able to identify them. 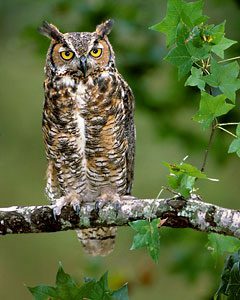 For example, the Great Horned Owl which is probably the most well known, has the deep HOOT, HOOT call. Their call is pretty distinctive. 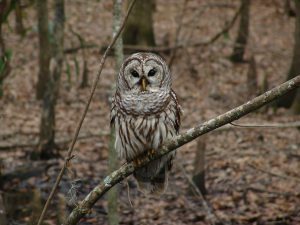 The Barred Owl makes a call that sounds like “Who-cooks- for- you, Who-cooks-for-you-all?” You may also hear cackles, hoots, or gurgles in addition to this call if it is during mating season. This is the one that made me think of monkeys hooting and hollering the first time that I heard it. The Screech Owl call has a long trembling type trill with a high pitch. This one reminds me of a ghost on Halloween and so can sound kind of creepy at night. I have learned these owl calls over time so when I hear them, usually at dawn or dusk and sometimes during the day, I look for them in nearby trees to see if I can locate them. Having a flashlight handy is a great way to scan the trees to spot them. However, once one is spotted don’t keep shining the light on them as it will make them fly away. Different owls live in different habitats too. By knowing where they live is another sure way to find them. Here’s a quick reference for the 19 species in North America. More information on these owls and where they live can be found on one of my previous posts – Owls of North America. Great Horned Owl – in residential areas, parks, forests, and in deserts. Barred Owl – mature forests made up of deciduous and evergreens, often near water living in tree cavities. 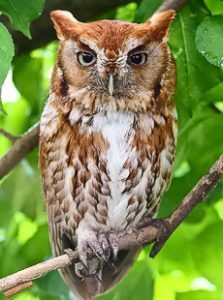 Eastern Screech Owl – in woodlands, residential areas, parks, woodlands, farm groves. 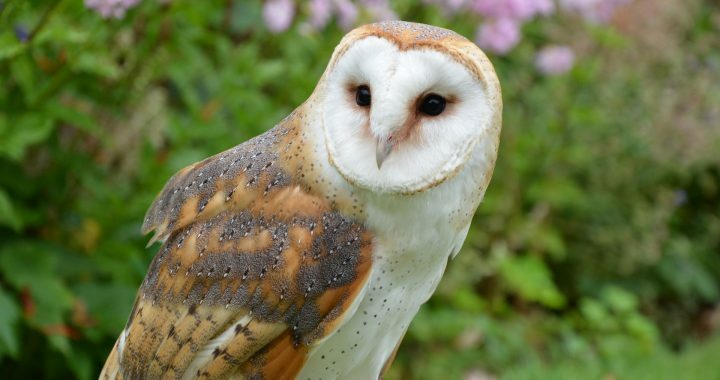 Barn Owl – near farms, woodlands, barns, towns, usually in open country. Northern Saw-Whet Owl – in forests, conifers, and groves. Short-Eared Owl – in prairies, marshes, near dunes, and tundra. Long-Eared Owl – near open woodlands, forest edges, along the river banks, juniper thickets. Northern Hawk Owl – open conifer and spruce forests with aspen and birch. Hunts during day and night. Great Grey Owl – open conifer and spruce forests with aspen and birch. Flammulated Owl – pine mountain forests. Boreal Owl – in dense northern woodlands in the highest of elevations. Burrowing Owl – open landscapes with low vegetation such as golf course. Northern Pygmy Owl – mountain forests. Hunts during day and night. Western Screech Owl – in the desert, in woods. Spotted Owl – in older forests and in canyons. Snowy Owl – on tundras, windswept fields or dunes. Can be seen hunting during the day and night. Elf Owl – near saguaro cacti, sycamores, cottonwoods, and other hardwood trees. Short-Eared Owl – prairies, near marshes, dunes and tundra. Whiskered Screech Owl – in the mountains by oak woodlands. There are quite a few ways to find owls near you. First of all it is good to learn which owls are specific to where you live and the type of habitats where you can find them. Also, learn their particular calls so that when you do hear one you will know what it is so you can locate it. Probably the best time of year is when the trees have lost their leaves in the fall and winter as they are easier to spot. The best time of day is dawn or dusk when they are out hunting for their next meal. However, you may even spot one during the day roosting in a tree. 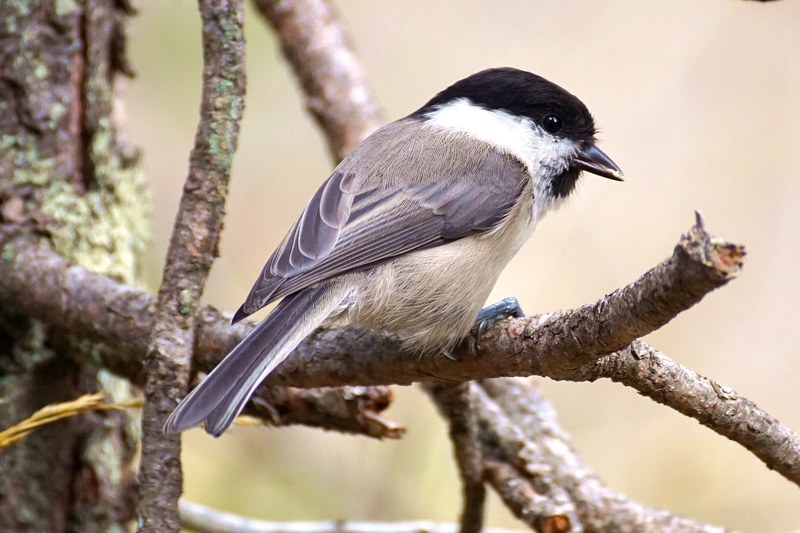 Sometimes you may hear birds such as the chickadee, blue jays, crows, and blackbirds mobbing one and can locate one that way. Whitewash on the base of trees or ground is another way to find where they roost. Owl pellets at the base of trees or posts are a clue too. Owl pellets are the bones, beaks, fur, and feathers, of small mammals or birds that an owl cannot digest. So they regurgitate this back up into an oblong shaped ball. A shiny black color means that it is more recent when an owl was there and a grey color means it has been there for a while. So be on the lookout on your next hike in the woods. You just never know when one will come along. If you do happen to come across an owl, I hope that you enjoy it as much as I do. Posted in Owls and tagged owls, owls of north america.